WRIGHT-PATTERSON AIR FORCE BASE, Ohio --- Members of the Air Force Research Laboratory and Lockheed Martin's famed 'Skunk Works' launched a new era of aircraft manufacturing technology and performance with the successful initial demonstration flight of the Advanced Composite Cargo Aircraft June 2 at Air Force Plant 42 in Palmdale, Calif. The ACCA fuselage is wider and stronger to accommodate military standard 463L pallets and features a cargo door and cargo ramp. The vertical tail features integrally stiffened skin. Despite its larger size, the materials and processes used for the fuselage reduced the number of parts by an order of magnitude relative to the original metallic design (approximately 300 versus 3,000) and drastically reduced the number of mechanical fasteners (about 4,000 vs. 30,000), program officials said. The flight marks the final and most significant milestone of Phase II of the Air Force Research Laboratory ACCA program, said Barth Shenk, an ACCA program manager from AFRL's Air Vehicles Directorate at Wright-Patterson Air Force Base. "This has the potential to change aircraft manufacturing as we presently know it, for the better," Mr. Shenk said. "Today's successful flight is the culmination of years of teamwork between government and industry labs involving hundreds of dedicated researchers across the country to fundamentally change the way we make airframes." Lockheed Martin officials said the ACCA took-off to the east from Air Force Plant 42 at 6:55 a.m. Pacific Time. The aircraft then banked west and climbed to an altitude of approximately 10,000 feet where the two-pilot crew took the vehicle through a series of airspeed and stability and control tests. Officials said the tests are important to understand how the composite cargo aircraft performs at varying speeds, attitudes, and altitudes. This data will be used as a baseline for future tests. "Today is one of those perfect days where I get to be the first to fly a new aircraft and everything goes exactly as planned. The aircraft was a real pleasure to fly and we experienced absolutely no issues," said Rob Rowe, the Lockheed Martin lead ACCA test pilot. Duration for the first flight was about 87 minutes. The new composite structure is manufactured without complex tooling and the bonding process yields a 90 percent reduction of structural components and fasteners, said Frank Mauro, the vice president of Advanced System Development for Lockheed Martin. "Historically aircraft cost has been generally determined by the size and weight of the vehicle. With ACCA we are proving that while size does matter, it isn't the be-all, end-all determination of aircraft cost," Mr. Mauro said. Lacking traditional fasteners like rivets, the composite structure is inherently aerodynamic. Mr. Shenk said he believes composite structures will address many of the corrosion and aging issues associated with all-metal aircraft, reducing airframe lifetime maintenance. Lighter weight of composite materials can also contribute to increased cargo capacity, aircraft performance and lower operating costs. The real game changer; however, is the maturation of manufacturing processes which collectively dramatically reduce the cost and complexity of building large airframes. The ACCA's first flight was made possible by a 10-year Air Force Research Laboratory-led research and development investment called the Composite Affordability Initiative. Government labs worked collaboratively with industry to develop advanced materials and manufacturing technologies, Mr. Shenk said. The ACCA's large composite sections are essentially formed, cured and bonded together in room-sized ovens, instead of using expensive autoclaves, which use a combination of heat and high pressure. Out-of-autoclave curing of large, unitized and co-bonded structures minimizes part count. The "ripple effect" of this approach contributes to costs reduction across every aspect of airframe production, Mr. Shenk explained. Tooling, raw materials, fabrication man-hours, quality control and floor space utilization efficiencies are realized. Together, they combine to greatly reduce cost, design and manufacturing complexity. "ACCA is the capstone test of integrating these composite affordability initiative principles all the way from conceptual design through certification and flight," Mr. Shenk said. "NASA Dryden Flight Research Center and AVCRAFT have been linchpin partners in our program's success" Mr. Shenk added. "NASA's expertise in experimental flight test programs helped us streamline our test preparations and AVCRAFT (the Myrtle Beach, S.C. based domestic maintainer of Dornier 328J), provided critical support on the aircraft subsystems so Lockheed could focus on the structural design, fabrication and integration issues." The ACCA test aircraft is laden with more than 600 sensors and accelerometers to measure stresses on its structure. Upcoming tests will focus on establishing the flight envelope of the ACCA to baseline its flight performance and validate predicted structural performance. PALMDALE, Calif. --- On Tuesday, June 2, Lockheed Martin and the Air Force Research Lab (AFRL) successfully conducted the initial demonstration flight of the Advanced Composite Cargo Aircraft (ACCA). 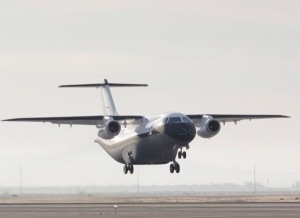 This flight marks the final and most significant milestone of Phase II of AFRL's ACCA program, in which Lockheed Martin replaced the mid/aft fuselage and empennage of a Dornier 328J aircraft with an advanced composite structure. "Yesterday was one of those perfect days where I get to be the first to fly a new aircraft and everything goes as planned. The aircraft was a real pleasure to fly and we experienced no issues," said Rob Rowe, Lockheed Martin test pilot. "Historically aircraft cost has been determined by the size and weight of the vehicle. With ACCA we are proving that while size does matter, it isn't the final determination of aircraft cost," said Frank Mauro, vice president of Advanced System Development, Lockheed Martin. "ACCA is an important step in proving that composite technologies are real game changers in reducing design and manufacturing costs along with extending life and reducing maintenance costs over traditional metallic aircraft structures." The road to this first flight started over a decade ago with industry and government laboratories collaborating in the AFRL-led Composites Affordability Initiative (CAI), a series of critical development steps in both materials and manufacturing technologies designed to mature dramatic, cost-saving processes. Out-of-autoclave curing of large, unitized and co-bonded structures minimizes part count and mechanical fasteners. The "ripple effect" of this approach spreads across every aspect of airframe production expense. Tooling, raw material, fabrication man-hours, quality control and floor space utilization efficiency are just a few of the factors that combine to create a compounding effect on cost when applied in a holistic manner. ACCA is the "capstone" test of integrating these CAI principles all the way from conceptual design through certification and flight. "This successful flight is the culmination of years of teamwork between government and industry labs involving hundreds of dedicated researchers across the country," said Barth Shenk, Air Force Research Lab's ACCA program manager. "This has the potential to change aircraft manufacturing as we presently know it, for the better." "NASA Dryden Flight Research Center and AVCRAFT (Myrtle Beach, SC) have been lynchpin partners in our program's success," Shenk said. "NASA's expertise in experimental flight test programs helped us streamline our test preparations and AVCRAFT (the domestic maintainer of the Dornier 328J) provided critical support on the aircraft subsystems so that Lockheed Martin could focus on the structural design, fabrication and integration issues."